We just bought a new couch. It's one of those massive modular sectionals that screams "My owners live in the suburbs and enjoy watching TV, taking naps and being lazy and comfortable on a regular basis." It allows the whole family -- me, Murdo and the two cats -- to spend an entire evening lounging together without feeling crowded. Murdo can grade papers on one end, while I can type away on my laptop on the other. When we put our work away, I crawl over to his side of the couch and nestle my head into its regular spot on his chest, my legs stretched out to the side while his rest in front of him on the ottoman, and we watch episodes of "The Sopranos" for the fiftieth time. We are really, really good at being lazy. Further proof of my laziness: Please welcome the third slow cooker recipe I have posted in the past two months! How many times am I going to tell you to throw a bunch of ingredients in the slow cooker and call it a day? I can promise you, this won't be the last. But I like to think that you're the type of people to appreciate this, because maybe you're not as lazy as I am, but I know that you get busy every once in a while, and there are days when you just want dinner to be ready, with no prep or real thought other than pulling out the plates and wondering what to watch on TV. Plus, it's cold out, and slow cooker meals are so warm and comforting. And there's a new couch downstairs just begging for a nap with you. Please, take this advice from a lazy girl: Buy a whole chicken and put it in your slow cooker. This is the ultimate lazy meal. Not only is dinner ready for Sunday night (or Tuesday night, or Friday night, or whenever the laziness decides to take over), but now lunch is ready for the rest of the week, as well. Chicken salads! Chicken pitas! Chicken soup! When eight hours have passed and you manage to pull yourself off the new couch and eat said chicken, there is no sawing away at the bird and trying to pull away every last bit of meat from the bone. The chicken falls apart in perfect pieces: two breasts, legs, thighs and wings, ready for whatever meals you have in store. Over a couple of years ago, I went on a roast chicken date with Shanna, arriving at her house one Wednesday afternoon to roast chickens and snack on crackers and goat cheese and apricot jam and chat about important things like long hair vs. short hair. (I miss those days.) She taught me how to roast a chicken, and I told you, "This is it! I will be roasting chickens for the rest of my life exactly like this!" Except after that day, I roasted a chicken exactly once more, and that was it. Apparently, sticking a chicken in the oven is way more work to me than sticking a chicken in a slow cooker. But you should know one main difference between an oven-roasted chicken and a slow cooked chicken: the latter will not produce the browned, crispy skin that the former is known for. 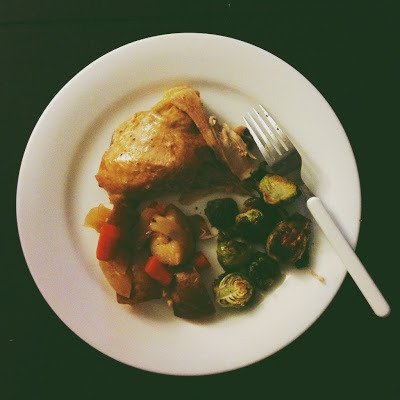 If you'd like a great recipe for a roasted chicken, I turn your attention to this post. And for those of you who are still here: Don't be ashamed. Embrace the lazy. You deserve it. The chicken produces its own juices as it cooks, so there's no need to add any liquid to the slow cooker. Feel free to add whatever veggies you like, or skip the veggies altogether. Place potatoes, onions and carrots in the slow cooker. Toss with salt and pepper. Season chicken generously with salt and pepper, and insert garlic cloves and rosemary inside the chicken. Place chicken in slow cooker on top of potatoes and onions. Cover and cook on low for 8 hours. Serve with roasted Brussels sprouts (recipe below). Preheat oven to 425 F. Toss Brussels sprouts with olive oil, salt and pepper. Spread in a baking pan and roast for 15 - 20 minutes, until edges are crispy and brown. Squeeze lemon juice over sprouts and serve. 1. You should know that I get freakishly happy every time I see you've posted something. Not kidding, my heart skips a beat. 2. I miss those roasting-chickens-together days, too. Mostly because I miss you. 3. You may have just sold me on crockpoting a chicken. Crockpotting? Either way. Also, (4) - you own a sectional! You are such an adult. Crockpotting! My new addiction. You leave the nicest comments. I am also in the couch shopping market! Dave and I just moved into our first condo and we left behind our old craigslist couches. Where did you get yours from? Costco! They have great deals on furniture. Roasted Brussels Sprouts is one of my absolute favorite things, thanks for sharing them along with your beautiful chicken recipe! Bedroom sets and chicken cacciatore. Slow cooker split pea soup.